While in New Orleans I decided to go on a tour of the gorgeous Garden District. The houses are all absolutely stunning, surrounded by gates and tall shrubbery. 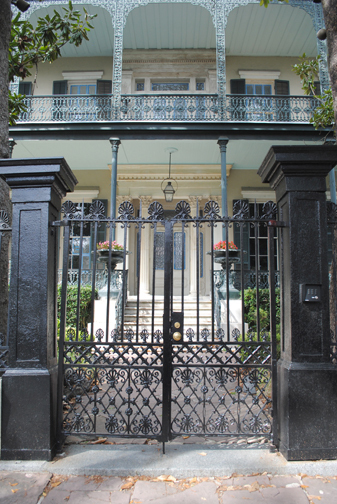 The Garden District is the place celebrities love to live it is quiet and the paparazzi does not bother them. Here are some gorgeous homes owned by some well names including Ms. Sandra Bullock! Love the Mannings and Sandra - how fun to see their houses! My favorite is seeing the Manning's house. Thanks! These homes are beautiful! 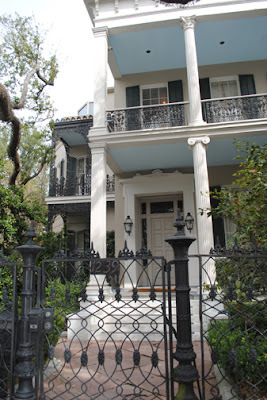 That's one of my favorite parts about New Orleans...the pretty homes! P.s. I had no idea that the Mannings lived/came from there! That's awesome. Those are all stunning. Reminds me of Charleston, SC. Don't you just love New Orleans?? All of those houses are so pretty. Absolutely stunning! I hope to take a vacation to NO one day! fabulous homes! Would love to see the interiors! Isn't the Garden District gorgeous?? I loved looking at all of the beautiful homes. Seriously wouldn't mind living there!! These homes are fantastic. Such style. wow these homes are beautiful. I think they might be a bit out of my price range. It's so odd to think of celebrities moving into other people's houses. I'd just assume they build everything new! These homes look so historic and beautiful! I like the Ann Rice one the best!